Hey guys. Long time, no post. 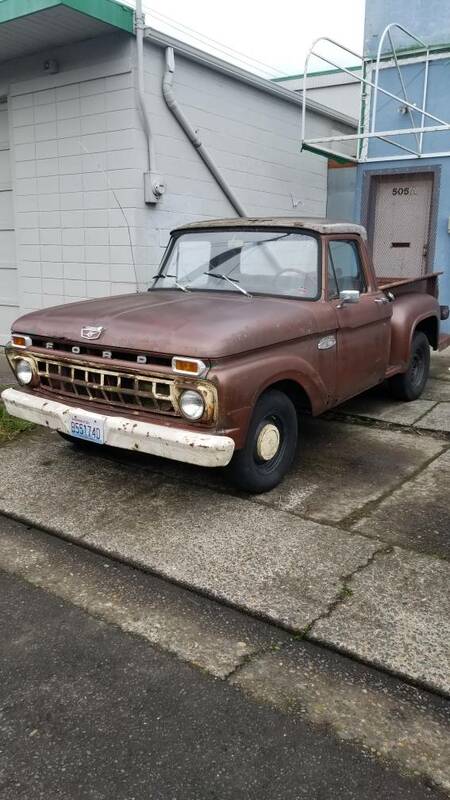 I recently acquired a friends 65 f100, short flareside, 2wd, 240, 3 on the tree. It's kind of a family truck, with a fair amount of sentimentality to it. This truck drives like a million bucks, so well that I tell people it drives like the day it left the ford dealership. Truck is all stock, rebuilt 240, all the lights work, cluster, heater, ect. Operationally, it's almost 100%. Here is the problem. It is an absolute rust bucket. Cab is definitely too far gone to ever be nice again. Hood is done for, bed is about that bad as well. Fenders aren't terrible, not great either. Grill and the rest of the front clip are ok, but that's about it. The truck is bad enough that you have to be careful not to shut the doors too hard, because chunks of rust fall onto the seat and you. Roof rusted off once, got scabbed back on. It's too good of a truck to knock in the head, but the way it is, in order to continue being a good truck, it needs a body. My question, is what gen 4 body parts are interchangeable? Obviously the grills and lights are different on a 65 versus earlier, but mine are ok. Are cabs the same? Flareside beds? My dash is in good shape and could be swapped in. I would like to keep it a 65, so I'm wondering if I'm looking for a donor from 65-66 only, or if parts swap from earlier rigs. Thanks in advance, any other information or tips would be greatly appreciated! Proud member of the PNW chapter! Flareside bed is pretty much the same 1957/72. 1973/76 is similar, but the bed mounting bolts are in a different location because Ford increased the width of the inner frame rails behind the cab from 33 1/2" used thru 1972, to 37 1/2" in 1973. Hood is the same: 1961/66 F100/700 & B500/700 (School Bus). Thanks for the info. I'm looking at a friends 64 right this second actually. I'm not seeing the difference between our two truck, as far as the actual cab goes? Am I missing something? Good to know on the bed though. Makes it easier to find one.